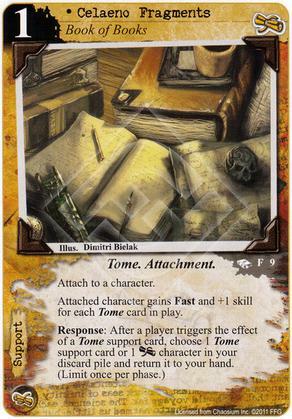 Chosen for Card of the Day by me, as I find the card interesting that it gives a small reward for being in play, but further rewards you for using more Tomes, and even your opponent using them (Book of Iod leaps out). With only two other cards adding Fast for the same or lower cost (Machete and Local Brew), and a skill boost on top, I feel Fast is a keyword easy to forget about, and for MU is otherwise only achieved with characters who are cost 3. For the second ability, having a means to get your MU characters or any faction's Tomes from your discard pile is nothing to sneeze at, as who doesn't like recursion. Do you have a favorite character to carry the Celaeno Fragments, NuFenix? When I was combining it with Yog, Obsessive Elder Thing with one of each icon was a star with it. Currently, no idea as the deck is untested, but may be who fits at the time. Though he isn't in the deck, Claret Knight for the same reason as Elder Thing would be a prime pick, as his skill is his only real weakness. This is the University Libraries deck you're referring to? Hmm. I've found it hard to keep two tomes in play for long (if at all). So, I haven't included this in any of my decks, yet. However, even with a single tome, it also allows you to return a character to hand. So, maybe it has some use after all. When I've had no other tomes, the +1 skill and Fast was very noticeable in games, pushing characters out of the range of skill limited abilities, such as Dangerous Inmate, Faceless Abductor or Ice Shaft (all examples I faced). This with Book of Iod to discard cards, then immediately get your MU characters back would work well, and both are cheap. Dangerous Inmate targets printed skill, so skill 2 characters with the Celaeno Fragments are still viable targets. Whitton would be my choice as well (and is also a personal favorite). She will be a big target though, so perhaps Professor Zeus can help with her research? When the Hastur deluxe expansion comes out, another fun option might be Hastur/MU rush. Use Danni Devine to fetch The King in Yellow Folio to leverage all the new terror struggle benefits. Obsessive Playwright and Professor Zeus could work well in that deck, too. Plus, the Playwright is a lunatic which should synergize nicely with the upcoming Treme card from The Thousand Young. There are 3 decent lunatics in MU to round things out (Eryn Cochwyn, Catacombs Docent and Ghost Hunter), with Eryn also benefiting from tomes. For Eryn Cochwyn, I would pair her with Research Assistant + Celeano Fragments. It could prove interesting, if a little janky. Hmm... I may have to build this deck when Treme shows up. If the Order of the Silver Twilight is bankrolling your University's endowment, then Meticulous Scribe and Sarah Van Shaw seem like logical choices. Sarah could even help you with Sigil of Doom or Stealing the Glory.